It would be nice to talk about newspapers riding the wave and leading the revolution rather than hiding in the bunkers from the rebels, but at the moment many papers are fighting at the rear and not charging ahead. Individuals are making the changes to their ways of working, and new journalists are coming online and using new ideas to break out of old structures – and that’s what will have to see most newspapers into the new age. Individual journalists have to be the change they want to see. With that in mind, then, let’s look at Vadim’s points. Several of them are great corporate advice, but from the coal face there’s little to nothing a reporter can do to affect them. As a rule the decisions about investment, charging and so on are made elsewhere, but some of what he says is very good advice for being a multimedia journalist, whatever your newsroom is like. Vadim’s right to point out that this should be a no-brainer, and right that it often isn’t. Newsrooms are still focussed on the print editions, with web falling behind. Change is coming – breaking news stories, for instance, are broken on the web in real time – but often the copy is recycled for the print edition. Exclusive content is rare, and stories (particularly in local media) tend to be written for print in a way that defies SEO. People are talking about “added value” as though a story on the web should have elements that add to the print story, rather than seeing it as a separate and valuable opportunity. Individual journalists are hampered by news scheduling (is it OK to break a story on the web if you think it might not make the paper that night?) and, in some cases, outdated web systems that make uploading pictures and video take longer than writing the story. With editors placing emphasis on getting print stories out, the sheer bureaucracy of writing for the web can be a deterrent for even the keenest web advocate. It’s not always easy to get the skills and knowledge necessary to do these things – particularly if you didn’t grow up with the web. But it’s vital to persevere, to get your stories out in print, on the website and via social media in the best form you can, because having exclusive content written appropriately for platform drives readers to you, and that opens up channels of communication – two-way conversations – that will keep people coming back. This is good advice for every journalist as much as every newspaper. You can’t write everything, you can’t make every contact – you have to develop subjects and contacts in your areas of interest. But on the web this doesn’t just mean working your way towards that coveted Crime Correspondent position – it can mean developing a position as a hyperlocal police reporter, for instance, or blogging about your village carnival in the context of village carnivals through the ages, or providing insight into the complicated and cut-throat world of artisan perfume trading. It’s about working out what your strengths are, writing those stories, and building a readership based on your specialities – and it’s much easier to do online. This should be obvious. It’s not. With the rush to get the web right, many papers have gone too far when it comes to providing cloned content on the web and ignoring the possibilities for print features and in-depth analysis to add value to breaking web news. 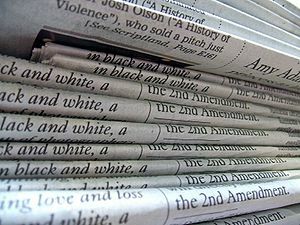 Reporters can choose to try and deal with the problems themselves – writing a straight news story for the web and a longer analytical piece for the paper – but it takes time, and journalists are hard-pressed for that even when they aren’t working in a newsroom that’s at 3/4 strength because of redundancies. It’s important for editors to ensure that there’s something unique every day – and to ensure that’s signposted from web and via social media to drive print sales – and it’s important for journalists to try and provide the content to make that an easy call. Vadim talks here about sharing links and acting as collators of information, sharing source material, as well as interpreting and summarising in traditional ways. Sharing sources is something that’s still alien to a lot of journalists. Emerging from a universe where your contacts book was to be guarded with your life into a world where anyone can talk to anyone is terrifying, and requires a complete paradigm shift to work with. Simply adding links to web stories pointing people in the direction of your source material if it’s online adds value to a story – it lets people make up their own minds, and it tells them that you are a source of information yourself, a collector and collator. People who read blogs are used to following links out to sources and context – why not news stories too? Linkblogging and writing roundups to share background can also help readers tap into the flow of information. A story is no longer a discrete entity – it’s a node on a network, and perhaps the journalist’s job is to try and make their story the central node. If your paper’s website has the technology to integrate Twitter feeds or real-time updates, use it. Chances are, though, that it doesn’t – and that means there’s very little you can do to help your paper collate and present the information that its journalists are putting out on the web. But you can contribute and do your own real-time reporting. Break stories on Twitter. Talk about stories on Twitter. Be an individual on Twitter – not a corporate retweeter or a PR machine – and make the news into a conversation. Link to the stories you’re reading as well as the ones you’re writing – collate and contextualise – and try to persuade whoever runs your website to add a Twitter widget that includes your contributions to the front page, if nothing else. These two things have never been more important, and they have to happen on an individual level. Too many papers run Twitter feeds like RSS feeds, without a personal touch – and that’s what RSS feeds are for. Too many papers don’t allow comments on stories, or only allow them on some, or have the comments pages entirely separate on forums. Newspapers have to value their readers, as Vadim says – and so do journalists. Giving readers the opportunity to talk to us and tell us their thoughts is now a vital part of reporting, and responding to that helps to build relationships. It opens up communication and abdicates authority – and, scary as that is, it’s the best way to become trusted and thought of as reliable and open. In an odd way, by abdicating authority your voice becomes more authoritative. Building community goes hand in hand with this – establishing a group of readers who talk to you in an open forum means establishing a group of readers who talk to each other, and that brings people together and keeps them coming back. And, while it’s important for papers to build communities, it’s even more important for journalists to participate in them. We are, or should be, our own readers – and we have to be involved.